With Easter just around the corner, more than 40 families in need from Ronald McDonald House South East Queensland received an early treat last night thanks to a special meal prepared by chefs volunteering from The Star Entertainment Group’s Treasury Casino & Hotel. 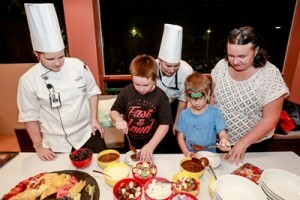 Normally serving up five-star dining experiences for guests in the iconic Brisbane establishment, they enjoyed the opportunity to create a special Easter meal for the families staying at the charity’s Herston House, including providing Easter eggs for the children to decorate. The volunteering effort is part of the company’s wider support to the charity after making a pledge in 2015 to raise $3 million dollars over three years – its largest community partnership in Queensland. The funds from the pledge are going towards developing the charity’s new South Brisbane House scheduled for opening in August/September, and supporting the charity’s Family Rooms at the Gold Coast University Hospital. “I’ve already got two kids so coming back to the House and having dinner already organised for the whole family is a real treat and definitely takes a lot of the day’s stress away,” Natalie said. Ronald McDonald House South East Queensland Chief Executive Officer Christopher Macaulay said the Make a Meal events hosted by The Star Entertainment Group were always a highlight for the families staying at the Herston House. “The Star Entertainment Group has created a wonderful tradition at our Herston House and we are honoured that their chefs are able to take time away from their busy schedules to produce an incredible meal for our families in and around festive periods throughout the year,” Mr Macaulay said. “Hosting an Easter-themed Make a Meal generates an immense amount of excitement in the House and offers our families an escape whilst dealing with difficult circumstances during their stay at Ronald McDonald House. The Star Entertainment Group Managing Director Queensland Geoff Hogg said the company was excited that 2016 will mark a historical year for the charity with the planned opening of its new South Brisbane House. “This facility will be vital in accommodating and servicing the patients and families attending the Lady Cilento Children’s Hospital and the Mater Mothers’ Hospital,” Mr Hogg said. “We’re proud to be part of this project to help build a community atmosphere where these families can socialise and support each other through sharing their experiences. “It is one of the more significant ways we’ve been supporting the charity but we’ve also had no shortage of our employees participating in various activities, from donating more than 130 toys to families over Christmas last year, through to tonight’s Make a Meal initiative by our chefs. “We know that parents often return to the House after a long day at the hospital and cooking a meal is probably the last thing they feel like doing, which is why we’re pleased to make their lives a bit easier thanks to our chefs volunteering their time to work some magic in the kitchen.